In a frontline sales job many years ago in my college days, I was in a live chat conversation with a customer that was going really well. I was pretty upset. It was demoralizing to realize this customer’s sale was more important than my feeling of safety and respect. A teammate whom I confided in took over the conversation with the customer, who never replied and never made the purchase. I swore if I ever became a manager (which I did) I’d never allow a member of my team feel this way and would instead foster attitudes like that of my helpful teammate. Live chat software is amazing. It can break down a lot of barriers between you and your customers. It allows for issue resolution/sales without lengthy hold times on the phone, and even help some customers become friends. But sadly, and inevitably, there will be people who abuse their access to your team. You can’t put a price on knowing how to react responsibly. You need to be prepared for how to deal with it – and know you’ll be supported by leadership – or your team is bound to churn. What is inappropriate/abusive customer behavior? If you’ve never worked in frontline sales or support, or if your front-facing dealings have been limited you may not know this happens. It’s easy to think of tough customer conversations solely being based around them being angry or having to say no. Inappropriate or abusive behavior is different to anger. It ranges from short personal comments, to abuse, to borderline harassment. We’ve seen “Hi gorgeous!” to “You’re a f****** idiot!” all the way up to sexually explicit photographs. Non signed-in visitors/leads are more likely to act in this manner because they benefit from anonymity. There’s no name, photo or email address attached to their conversation. However, paying users can be just as inappropriate. They’re still behind a screen. They may think it’s funny; they may be lonely. Their motivations differ, but what shouldn’t change is the stance managers should take and how they equip their teams to deal with such behaviors. Ask a teammate to take over at any stage, and a manager will step in where appropriate. Even if a comment seems ‘harmless’ to one person, it can make another feel deeply uncomfortable and they don’t need to go on. If a visitor conversation begins with inappropriate comments that are beyond what deserves a reply offering product assistance (explicitly abusive or sexual in nature), block that person immediately. If an ongoing visitor/user conversation starts down the road of “Hey you’re really good looking!”, or “Are you f*****g stupid?? ?” steer the conversation back to the product and don’t acknowledge the comment. I know from past experience that you can feel silly asking for help. You try to play it down and tell yourself, “I’m being too sensitive.” Proactively encouraging teammates to feel safe asking for assistance and to look out for each other breeds an environment of non-judgement. Sometimes I receive DMs from teammates alerting me of a conversation happening with another teammate, encouraging me to step in. The beauty of Intercom is being able to see everything unfolding in the moment and easily being able to reassign a conversation. The key to building trust with your team is never ignore the situation or laugh it off. Confront it head on, take it seriously and let them know you’re there for them. A manager should never be afraid to step in and take over a conversation that’s getting out of hand. If they spot it happening in real time, they should offer to take over as a teammate may not feel fully confident in doing so, as described above. This applies equally to non-paying and paying customers. 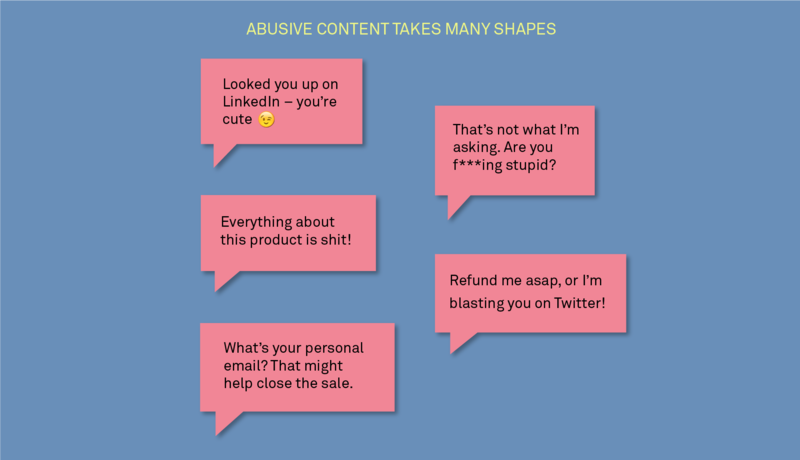 It’s easier tell a nameless, email-less lead you’re blocking them than to lay down the law with a high paying customer; however, the effect abusive and inappropriate comments have on teammates are the same, no matter the MRR. Don’t be as quick to hit the block button for paying customers, but be sure the team knows that no matter how much they pay your company, they’re not worth more to you than your team’s well being. Dealing with inappropriate or abusive conversations is a different judgement call every time. Not every customer reacts the same way to being called out. But as a manager, remember every teammate deserves to feel valued and respected. As leaders we have a duty of care to our people. A frontline team who sees their manager and company care more about their wellness than an inappropriate customer’s revenue feel valued. Showing them how important they are is key to their happiness. Happy people are more productive and your company will be more profitable. Place your people first and the rest will follow.